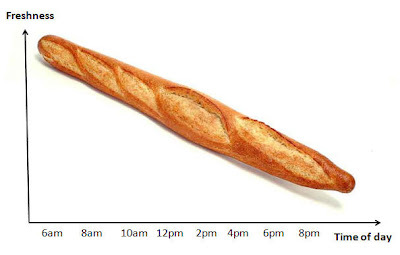 The Math Mom: The Curve of Baguette Freshness and Other of O-la-la Moments. The Curve of Baguette Freshness and Other of O-la-la Moments. This August we were lucky to spend a few weeks traveling around France: first we explored Paris, and then drove South to the magnificent Loire and Dordogne river valleys. Below are some math vignettes from our adventures. Feel free to post your thoughts to either the mathematical or non-mathematical musings in the comment section below. This trip consolidated my opinion that Paris is the most beautiful city I have ever visited, with the worst food I have tried. I know, many of you will disagree with either statement, but hopefully not with both. Don't get angry, this is just my personal opinion. I have been in Paris before but I have forgotten the magnificence of its museums and churches gracefully situated along the Seine, the elegance of the Gothic architecture, the beauty of the city gardens, the gentle curves of window rails that differ from building to building, the rich history you can google and visualize on every street, and the ingenuity of the modern buildings on La Defence. Image by Tallapragada, distributed under CCL. Before we left for France I idealized the baguette for my kids, promising them daily bakery shopping and picnics on the grass. But we all quickly learned the delicate lifespan of this symbol. Following is a graph of baguette freshness. Baguette is at its best around 6am when it is just baked. It is still a bit warm around 8am when you buy it and steal a generous piece. It is cold, chewy on the outside but soft inside when you eat a sandwich with it around noon. By the time it is being served for dinner in a breadbasket it is a jawbreaker. In one of the attempts to eat something other than baguettes or crepes, following an advice of a local, we ventured into the Chartier restaurant on Montmartre street. Great atmosphere of a busy old train station, good and inexpensive food that, as everywhere in France, lacks fruits and vegetables. And of course, coffee with dessert, which brings us to math. In our party, two people ordered decaf and one a real coffee. The waiter brought a large plate with three small identical cups on it. To my question which one is the caffeinated he reluctantly pointed to one and quickly retreated. There was absolutely nothing on the plate to distinguish this cup from the other two, it looked like a joke but we were far from laughing as one of us needed caffeine for driving and two others were looking forward to a good night sleep. What do you think were the chances that the cup I picked was really a decaf? Serendipitously I discovered a great way to make our kids spend half-a-day in the Louvre and think it is fun! Daisy de Plume, New York expat living in Paris, with a background in art history and tremendous knowledge, created a series of Treasure Hunts that you can do at the Louvre. Ours was "The Best of Biestery" and we scanned half of the museum in 3 hours looking for the paintings, sculptures and vases that Daisy described. The proof that we found each was a family snapshot in front of it. If you are heading to Paris, check out Daisy's webpage, ThatLou, for more details. Beware that it is for adults and older kids ages 10 and up. Our team won, largely because we had one local on it who had been at the Louvre in the past and I did some homework scanning through Daisy's blog for hints on the treasures she likes and memorizing few room numbers (all following her suggestion). Our local friend introduced us to a simple and captivating card game. Type of a game that you wish you created yourself. 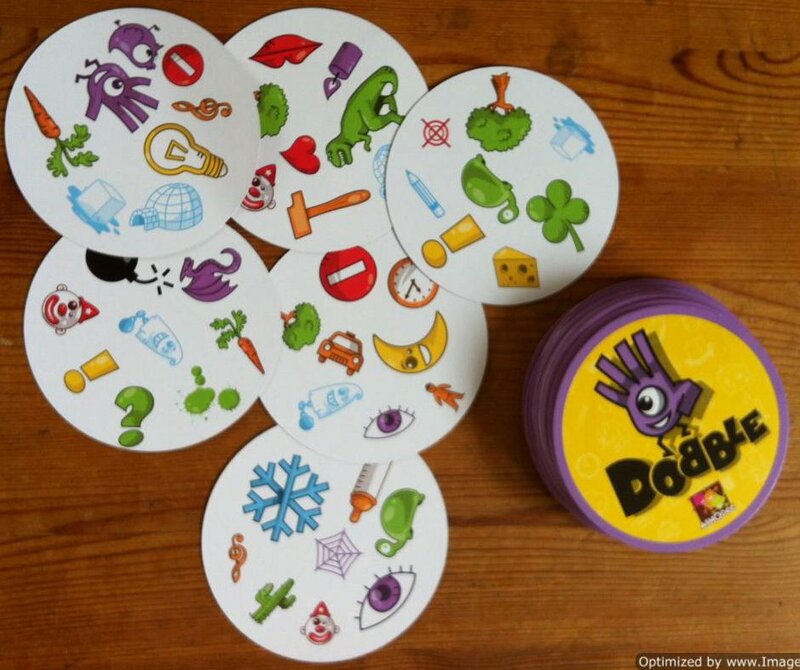 It is called Dobble in French. There is a set of cards where each card has 8 objects on it and every two cards have one and only one object in common. An object may change its size but not the color. There are few options to play this game but the simplest one is to divide the cards between players, living one at the center as the starter. On a count all the players flip their top card and carefully but frantically compare the card in their hand to the card in the center trying to name an object that is common. The person who does it first places her card on top of the center card, flips the next card in her pile and the game continues. First to get rid of all of his/her cards is the winner. How many cards are there overall? We noticed a peculiar detail, that when you divide the cards between two players there is one card left, and when divide between three - there is one left again. After you figured out how many cards there are, can you count how many objects are there overall if every two cards have only one object in common? When we borrowed our friend's car to drive down South to the Loire and Dordogne valleys, he warned us of extensive automatic speed ticketing on the French highways. Apparently you can get a ticket even if the difference between time stamps of entering and exiting a paid highway is less than the shortest possible time you can legally drive between these points. This sounds simple but we noticed that various road segments have different speed limits. How do you think French police calculates the shortest time? Delighted to see Paris depicted by the Math Mom! Some points you raised need a bit more explanations from my side. You are absolutely spot on with baguette freshness: usually eat it within 4-6 hours after it left the oven, which is the reason why most bakeries offer different types of bread that can be kept for a few days! Ah, and baguettes can taste radically different from one bakery to the next. You should have tried a large sample of bakeries but August is not the right period for that. Just read an article about radars in France: a policeman admits they have to maximize revenues. A correctly-placed radar must bring 3 new "customers" per minute. Problem: if you leave a radar for more than a few hours in the same place it gets registered with various (legal) warning systems like smartphone apps or networked GPS devices and the number of customers decreases. They need to change places at regular intervals but their monthly gas quota is also limited, so they do have to optimize their booby-traps to several closeby places in random order. Yeah... Who said this had anything to do with road security? France is a big and diverse country so the cuisine is diverse. Mexico is bigger, Russia is larger, China is larger still (I think?). Gotta find what you like, if you can. 19 cards I think? Just came to me. Seven and 13 won't cover many players AND certainly won't accomplish the object criterion. Might need even more; 31? 37? 43? I dunno. The "simplest" way for the police to establish the minimum legal time to travel any stretch of road is to drive it at the speed limit. Math would be the hard way! I remember they used to do time stamps on the Penna Parkway when I was a kid; they may still. 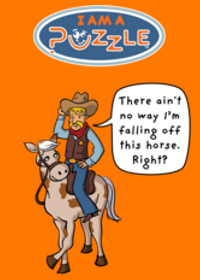 Aw, I forgot about the decaf puzzle. I see several issues...depending on how we read the waiter's reluctance. It is entirely possible, in Paris, that all 3 cups were identical and caffeinated (he forgot), in which case there is NO chance you got a decaf. Or all 3 were decaf, in which case you most definitely did, 100%. Or the waiter was confused and no longer knew which one was real, so he guessed. If it's his guess and the order was filled properly, your guess is as good as his and your odds are 2 in 3 of getting a decaf. Or, the order could have been poured right but your waiter could fib because he didn't like your French accent. In this case (a lie), if your driver takes the waiter's advice, the driver WILL get a decaf, and one of the two sleepy passengers will get leaded. Or the order could have been filled backwards, with 2 caffeine. Hey, all these things do happen. And the waiter still could fib, or he could still not know. All bread is best, I think, when it is just baked, and I rarely get it that way. Bagels and baguettes too. I'm not sure the staleness curve is a straight line. Plastic bags will help considerably but I think you'd need to bring your own bag in Paris. Did you really mean to say that there are no fruits or vegetables with a meal? That would be devastating to Mary and me since we don't eat anything that had a mother and moves. Oh dear! One of those horrible puzzles where you can't decide the probability because it is either subtle or obvious. I'm going to say it's obvious. You are 100% certain if you believe the waiter. The person doing the driving should believe him and take his cup. There are two left. They are both decaffeinated. Pick one. If you don't believe him (perhaps there is a language problem), you have a problem. You have a 2/3 chance of getting what you ordered. If there is uncertainty about belief (he can go either way) then 1/2*2/3 = 1/3 is a possible answer. There is a book called the lady and the tiger by Raymond Smullyan at Amazon which is filled with puzzles like this one. Frankly I'm not very good at them. This game is called Spot it in the United States and sells for $9.00 on Ebay. This game has n^2 + n + 1 ways of distributing 8 symbols per card 57 different symbols and 57 cards when n = 7. I'm sorry to report that I understand very little of how that might have been obtained. My math expertise simply does not go in that direction. Not all symbols are evenly distributed as you might think they have to be. See the second reference for this. It is not surprising that there can be fewer cards than what is theoretically derived from the formula. See discussion on 3 symbols and 4 cards with 6 symbols in my second reference. By the way, spot it and Dobble both have 55 cards. The total number of pictures is 55*8 = 440 but they are not evenly distributed. My favorite joke when I drive in British Columbia (our sister province to the west of Alberta where I live) which I often ask my kids since they both live there, is "What's the speed limit in British Columbia?" It took them awhile to catch on to the fact that there really isn't one. You don't like what you see now, wait ten minutes and it will change. It always does. The reason you can't simply use d = r*t and solve for t is that you have to take into account the deceleration period between different speed zones. Even if you put a sign on the road warning of a change in speeds our car (for example) seldom makes it down to the posted limit after seeing the warning. The only way I can think to do it is to get 100 cars to travel over the distance and record their times. Being just a bit liberal add a reasonable +/- fudge factor and call that the official time. By the way, welcome back Maria. It's sure nice to get these thought provoking questions. So many great answers and pointers. Here is the summary of your answers and my thoughts. I will also send this in a newsletter because these are great life puzzles. As some of you pointed out there are few possible scenarios. Given that we are talking about France where decaf is not very common and that this restaurant works as a factory, I think the most likely scenario is that all the coffee cups are filled with caffeine. I call this Scenario1 and assign this a high probability of 0.5. Scenario2 is when all the cups are filled with decaf. Lets say it has a lower probability of 0.2. And the Scenario3 is when the waiter really filled the order and brought two requested decafs and one caff. Lets assign this the remaining probability of 0.3. We assume that no other scenarios are possible. In the Scenario1 my probability of getting decaf is 0. In the Scenario2 my probability of getting decaf is 1. In the Scenario3 this probability depends on whether the waiter correctly pointed to the caffeinated cup. If he did, then in this situation my probability of drinking decaf is 1. If he didn't then my probability of drinking decaf is 1/2 as only one of the two non-pointed cups has decaf. Let's say that both of the above events are equally likely. I must have lucked out because I did get a good night sleep that night. Or, I might be underestimating French waiters. Turns out this game exists outside of France and is known as Spot It. Jerome is saying you can get it on eBay. How many cards are there? From my hint that one card is left when you split them between 2 and 3 players you correctly concluded that the number of cards should be divisible by 2x3=6 plus one as a remainder. It can be 7, 13, 19, 25, 3, 37, 3, 49, 55 etc. The first options are just too small to play with. But any number after 37 is reasonable. In fact there are 55 cards in this game. Jerome posted a link to the interesting mathematical analysis of this game. Apparently in a mathematically precise game there are should be 57 cards and symbols. By some reason in Dobble and SpotIt two cards have been dropped. But wait, there is more! Someone counted and discovered that each object does not appear in equal frequency with others; the min is 6, the max is 10. Clover is more common than flower, maple leaf or snowman. I was imagining a policeman sitting with a map and calculator but Tom and Jerome, both, suggested empirical testing. Police drives each segment with a legal speed limit and uses the resulting sum of times as a threshold. Or, it can be an average of a times of a number of legally driven cars. Possibly a margin can be added to this time to allow for speed change in-between the segments. "Just read an article about radars in France: a policeman admits they have to maximize revenues. A correctly-placed radar must bring 3 new "customers" per minute. Problem: if you leave a radar for more than a few hours in the same place it gets registered with various (legal) warning systems like smartphone apps or networked GPS devices and the number of customers decreases. They need to change places at regular intervals but their monthly gas quota is also limited, so they do have to optimize their booby-traps to several close-by places in random order. Yeah... Who said this had anything to do with road security?" Thanks for the dialog! We all learned quite a lot from these questions and answers. Everyone who answered gets a puzzle point for each puzzle. Eat your baguette before lunch time and I will be back next week.